The Governor of Rivers State Nyesom Wike has accused security agencies in the country of abetting election rigging during the Ekiti and Osun gubernatorial elections. Governor Nyesom Wike stated this while declaring open the One Day Conference of Nigeria Bar Association-Section on Legal Practice- Committee on Democratic Process and Electoral Litigations in Port Harcourt. Governor Wike during the event urged Nigerians to resist the over-militarization of elections, election rigging, and vote buying during the 2019 general elections. 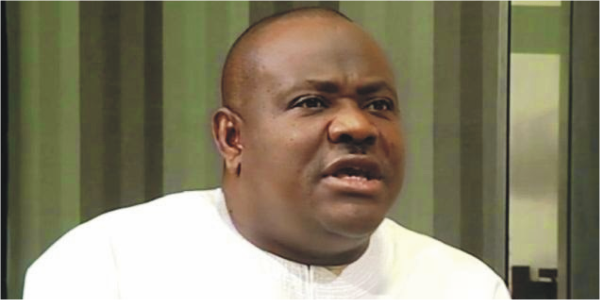 Wike also alleged that some politicians are de-marketing the state through cheap propaganda and blackmails. He also called for a strong internal democracy among political parties in the country. The National President of Nigeria Bar Association Paul Usoro, represented by the Secretary of NBA Jonathan Gunu said the one-day conference was put together to mitigate challenges that will arise before and after the 2019 general elections. In the meantime, the Governor of Ondo State, Rotimi Akeredolu said politicians are now abusing the use of court orders during litigations. Rotimi Akeredolu while making his comment during the one day NBA Conference in Port Harcourt said the scene where a politician will have different court orders on one particular issue is worrisome. The Governor of Ondo State Rotimi Akeredolu also appealed to INEC to resolve all the impending cases arising from the card reader before the 2019 general elections. In his address, the Attorney General of Rivers State and Commissioner for Justice, Dr Zaccheaus Adangor called for the creation of a database for decisions of the court to avoid the issue of multiple court orders on a particular case. Meanwhile, the Independent National Electoral Commission INEC says the series of different court orders emanating from the conduct of party primaries is a source of worry for the commission. The National Chairman of INEC Yakubu Mahmood said the commission is also faced with the confusion in the interpretation of section 87 of the electoral act as amended as regards party primaries. Yakubu Mahmood, represented by Festus Okoye called for an alternative means of resolving pre and post-election matters in Nigeria. The National Chairman of INEC Yakubu Mahmood also said the card readers have been enhanced to perform effectively ahead of the general elections. He stated that INEC can only conduct free and fair elections when political stakeholders contribute their quota in the electoral process. Our Correspondent reports that the theme of the one day NBA Conference is the Role of litigation in the 2019 Nigeria Electoral process.